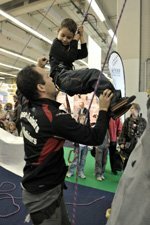 With over 250 exhibitors and 30 different workshops there will be plenty of hands on family fun for both parents and children at this years Kidexpo. The event is divided into three sections "Education" "Games and Recreation" "Sports & Leisure". Sports to try include, skateboarding, rollerblading, basketball and free style climbing. There is also a Family Rollerblade outing starting at 9:30am on Sunday morning. Children can check out the latest in games and toys for the 2009 Christmas season.